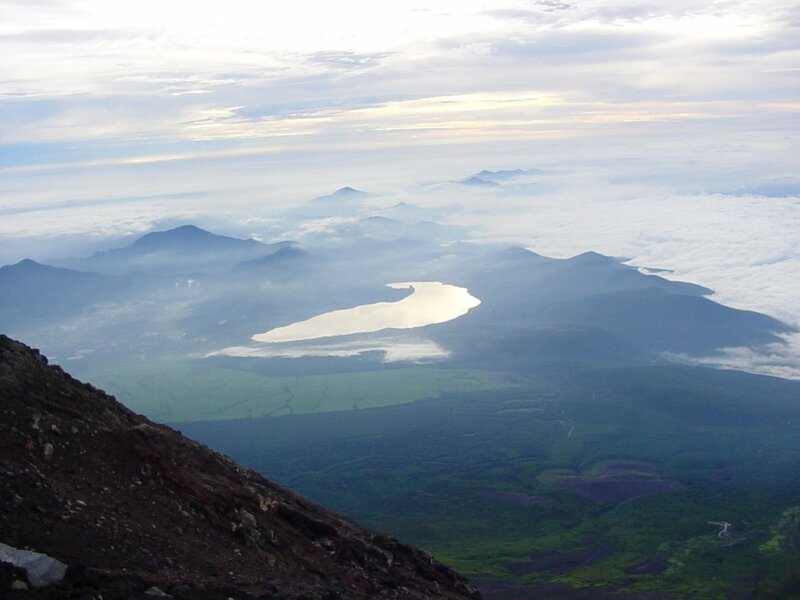 Climbing Mount Fuji (or Fuji-san, 3776 m) is a lifetime experience. This is the highest mountain on Japanese islands. 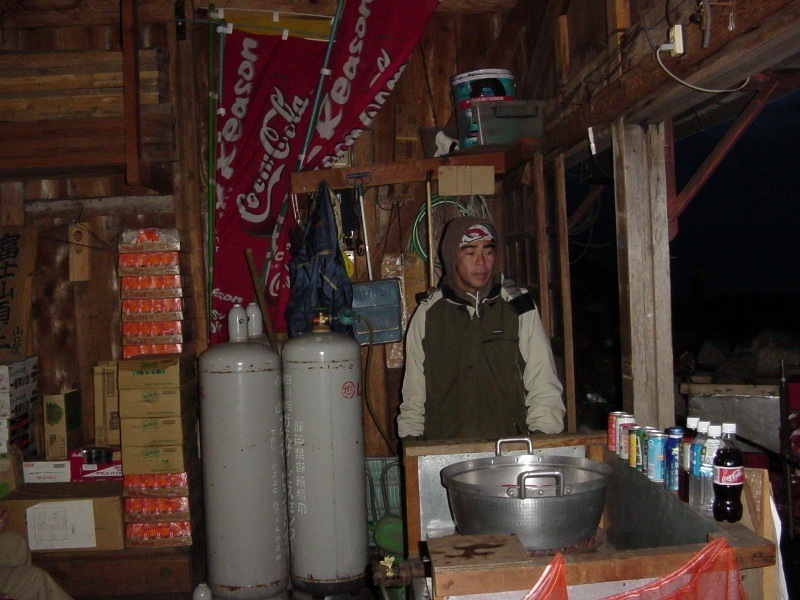 In this post I describe my climbing in July 2002, starting from Tokyo. But this is not only about climbing and about the magnificent mountain. There is more to it, an episode which left mark on my soul forever. I can only hope I shall be able to present it to you in a way I feel about it. Give it a try and read at least the second part below. Mount Fuji looks so perfect with its conical shape that for some people it may look unreal. Here is one episode about this. I was attending a language course in Belgium, and for an oral practice, we were told to bring something to speak about. I took a photo of Fuji-san. There was a guy from South America in the group, and he was convinced that the photo was retouched. “No mountain can look like that”- his words. My explanations did not help, he knew what he knew, end of the story. Hokusai: The great wave off Kanagawa [courtesy of Wikipedia]. Fuji-san in the background. It is hard to explain by words how much this mountain overshadows everything around, and how mighty it looks like. Indeed, no other mountain looks like that. Though I would like to add that Teide mountain on Tenerife island, the highest Spanish peak which I also climbed overnight couple of times, reminds me about Fuji to some extent. 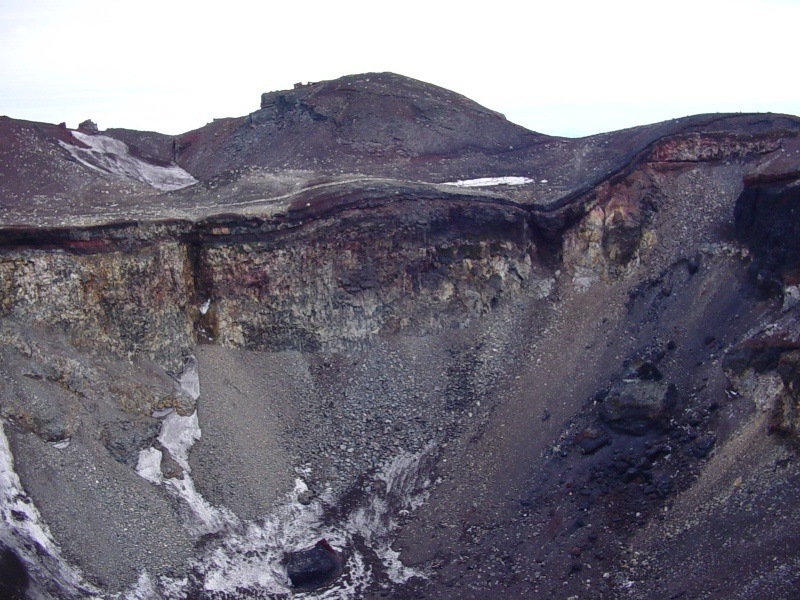 When I climbed Mount Fuji in 2002, this was my highest mountain till that time. 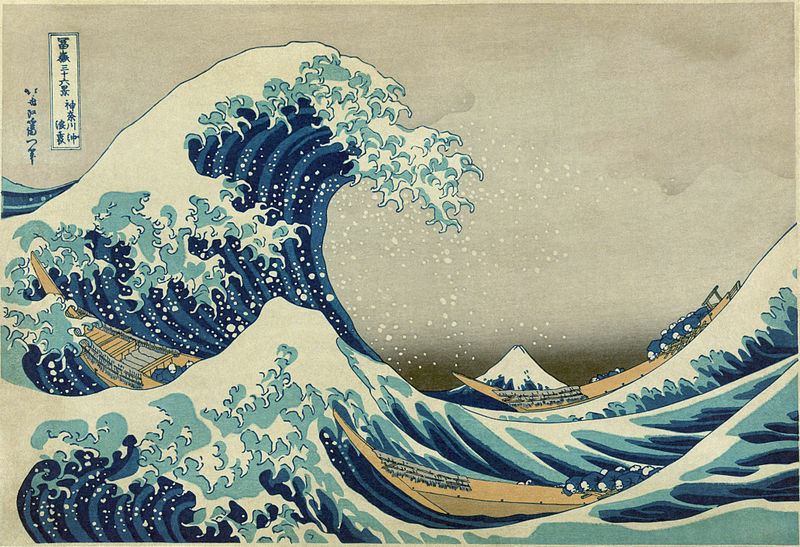 It was the rainy season in Japan and, as usual, it coincides with the climbing season (July-August). 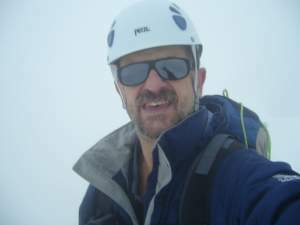 When you are in Japan you will see on TV when they announce the formal beginning of the climbing season, and for such an occasion climbers turn up in hordes at several starting points below the holy mountain. 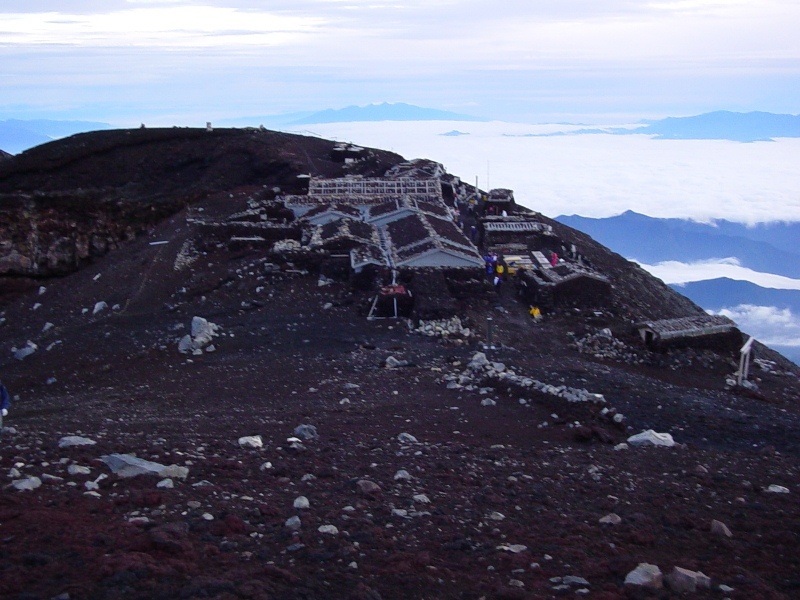 Summit station at Mount Fuji. Obviously, it was difficult to have a day with a stable weather. But eventually the forecast was good for one single day, and in afternoon July 8th, I rushed toward Shinjuku station in Tokyo and took a bus toward so-called Fifth Station which is at around 2200 m above the sea level. 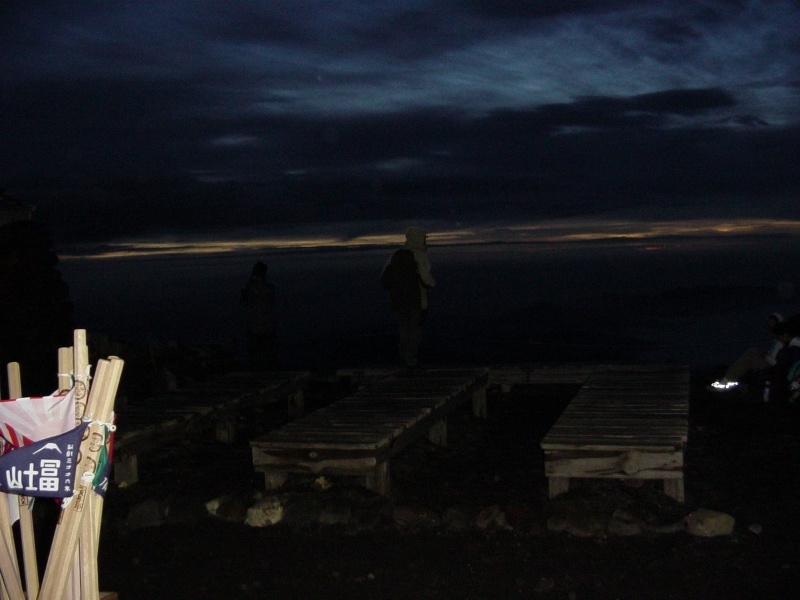 This was also my first night climb; I wanted to be on the summit at sunrise. But many others had the same idea. So, although this was formally a solo tour, almost all the time there were people somewhere around. Many of them were passing by me as I was rather slow that night. I set off at 10:30 pm, and I was on the summit at 4:30 am. 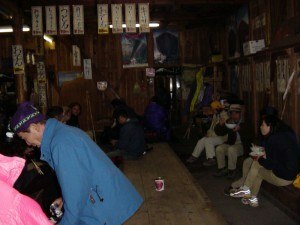 I had enough time to have a hot coffee in the shelter on the summit before the sunrise, which was far from spectacular due to clouds in the east. In these moments they play the Japanese anthem at the shelter. The climb itself was just an unproblematic but rather hard walk where you feel the high altitude. 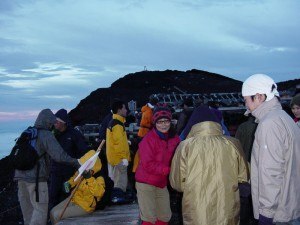 In the morning when I started descending the mountain I could see a long line of people coming up. And I noticed that from time to time, some elderly people were using small bottles with oxygen. Their progress was slow but constant; the rhythm of their steps was 1-2-3-stop, 1-2-3-stop. Slowly but persistently they were making their way up. Regarding equipment, you will need nothing special, just a pair of normal strong hiking shoes and warm clothes for the summit. Walking poles are always good to have. I had about 3 liters of liquid, but if you do not want to carry you may have it on the way up. There are several very pleasant places (stations) on the way up, where you may have a warm meal and even stay to sleep if you feel tired. Not many people were entering those stations that night, obviously, they all wanted to be up there when the Sun rises. 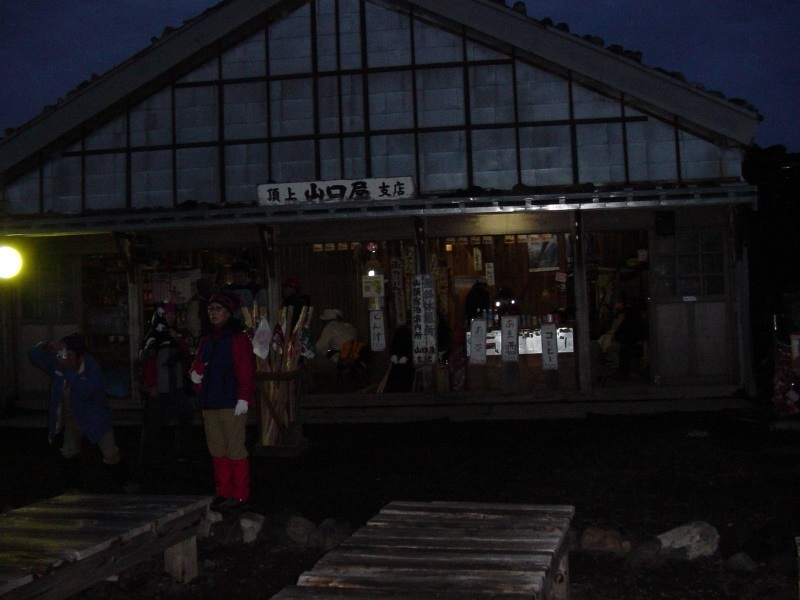 Besides, there is a shelter (9th station if I remember correctly) on the summit itself. During the night I met a Japanese climber who said he was on another holy mountain a few days earlier and visited some temples there in order to pray for a good weather for Fuji-san. Apparently, it worked. We had the perfect night and the day after. The rain came only when I was safely on my bus back to Tokyo. My unknown friend on the way up. He was the one who was praying in temples for good weather on Fuji. Fifth station, start of the trail. Me with people on the summit. Coffee available at 3776 m.
People on the summit of Mount Fuji. 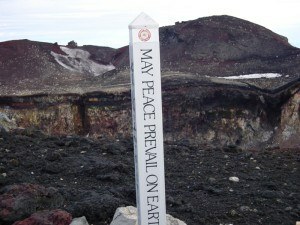 The summit of Mount Fuji. But while standing on the summit and seeing dark forests that extend for many kilometers everywhere around the mountain, I could not forget yet another experience a few years earlier, related to this same mountain. Below is this episode. We were on a tour around the mountain, the year 1999. 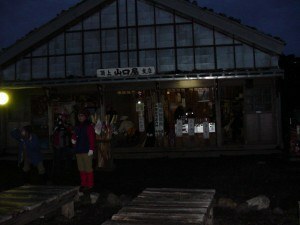 It was early spring, mountain officially closed. 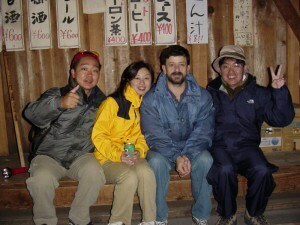 My guide was my dear friend Mitsuo Kono (see him on a separate page here) professor at Chuo University in Tokyo. 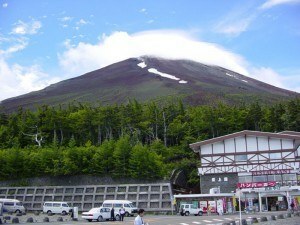 Probably knowing my weakness towards the mountains and towards Fuji, he proposed that trip. Of course, all the roads that led directly to the mountain were closed because of the snow, and we were left only to enjoy the low-lying areas of the mountain. The weather was again rainy but improving a little bit, so intervals without rain we used for short walks in the surrounding area. We walked around the lake whose shores were covered with black sand. Of the same color were the walls of the buildings around. It was solidified lava. We went to some caves and followed narrow paths through the thick forest. Mitsuo was telling me that at the time of the shogun, during the summer time the villagers would carry the ice from these caves in baskets to Tokyo. The top of the mountain was not visible, lost in the clouds that were very low. But the presence of the mountain was felt in only a very gradual, slight elevation of the terrain in the same general direction, toward the invisible summit. Mitsuo was also speaking something about how Japanese people were committing suicide. He said, if someone felt saturated with life, rejected by the society, he or she would simply walk in the vast and impassable forests which cover the basis of the mountain. It was, of course, the path of no return, in one direction. “A strange people and strange folk traditions from the past,” I thought. In this road-less area, it was weird to see something that looked like mailboxes of transparent plastic, which were hanged on trees, next to the trail which we were passing. Something was written on them, and I asked my companion to explain to me what it was. Of course, completely shocked, I realized that she story about suicides I heard from him before that, was not a “folklore”, but something that was happening all the time. Looking into the bush, which now looked frightening, I guess I was wondering how many of them were in that moment out there, exhausted by hunger, counting down their last minutes. At dawn on Mount Fuji and dark forests far below. So, later, standing at the summit of Mount Fuji that July 2002, I remembered those “mailboxes” from the dark woods far below. This spoiled the usual great feeling of being on a mountain summit. In fact, the same thought came back again: how many of them right now, right there? 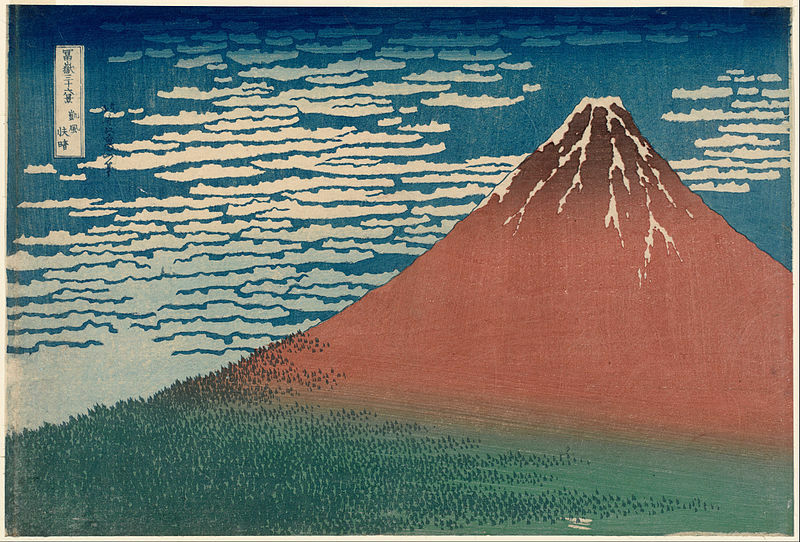 When I read about one or another lunatic in the West, who starts going around by killing everybody on his way to his own death, I cannot stop thinking about those in the woods at the foot of Mount Fuji, who walk into death in a quite different way, quietly and with dignity. And I think about how very different we are. This was my story about this magnificent mountain. I hope you like it. English is not my native, and I cannot express all feelings I have had then, and which I have every time when I think about it. I give here two videos from YouTube about Aokigahara suicide forest, or Sea of Trees as it is also known. They might be disturbing to some. Please share your thoughts and leave comments below. Perhaps those who go to the forest to die want their last moments to be in a place of peace and beauty. For those of us who are not climbers, your stories let us share the experience vicariously. Hello, Jovo. Great article! The photos are great and your videos were awesome. It hard to believe that people really do commit suicide in such a beautiful place. Thank you for sharing your experience. Wow! What an adventure, experience and story!! I enjoyed reading this very much. The forest in Japan is notorious for being haunted. I am not sure if I would be able to experience it!! Thank you so much for sharing this exceptional blog with all of your readers. Great content well worth coming back for some more. You are so adventurous!! 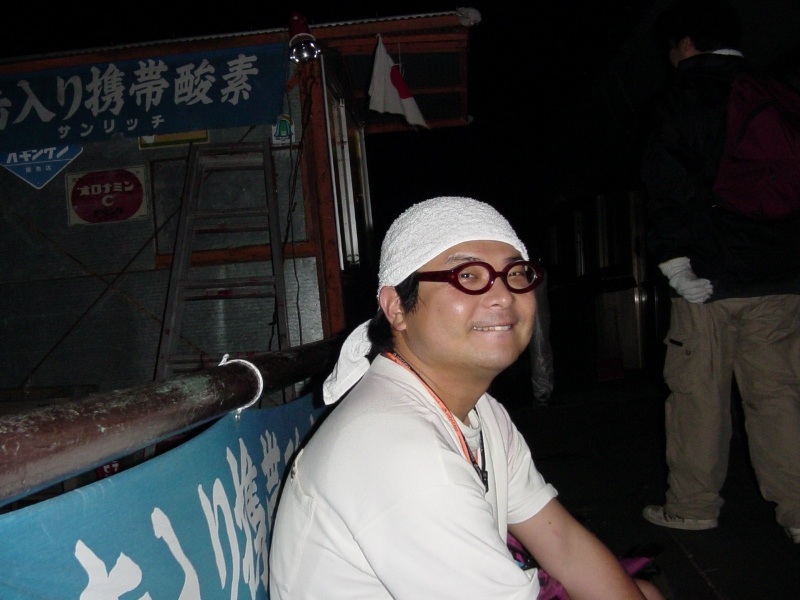 I really appreciate your awesome story about yr adventure on “climbing Mount Fuji”!! Great adventure read! Besides the tour with the picture, I was impressed by the dark secret of the forest. INcredible! I really enjoyed that post. Both the part about the climb and the photos. Even more so I enjoyed when you spoke of the mail boxes and the dark forest. Thank you for sharing your experiences. What an amazing story Jovo, pictures are awesome. I don’t think I’d ever have the guts to climb a mountain but kudos to you for doing it. Seeing those mailboxes must have had an impact on you which will probably last forever. It’s so sad just thinking about it, but at least they didn’t kill anyone else and went out on their own terms. Thanks for sharing this story. Mt. 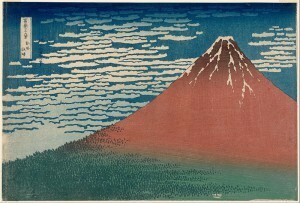 Fuji!!!! Are you kidding me. That’s sweet dude. Can only imagine now a days. I’m certain this site will do well. Climb on Wayne….climb on Garth lol. And the last part was especially interesting: I have seen these kind of stories of old people going to the forest to die, in Kurosawa movies. It is indeed a bit frightening to know that this does happen. Keep on climbing and sharing! Hi Andrea, thank you. I did not know about this part from Kurosawa’s stories. Those boxes were indeed something I could not forget. Thank you. If I remember it right, it was in Dreams – I will have to watch it again with my Babe who is a movie AND a mountain freak 🙂 I will show him your site. Wow, those views are simply stunning, Jovo! You’re so high up, it’s like looking out of an aeroplane window!